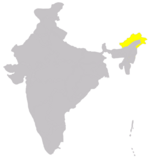 The Apatani or simply Tanii, designate a tribal group of approximately 60,000 in Ziro in the Apatani plateau in the Lower Subansiri district of Arunachal Pradesh, India. Their language belongs to the Sino-Tibetian family (see Tani languages). The Apatani, recognized by UNESCO as a potential World Heritage Site for their highly efficient agriculture without animals or machines, have been striving to protect their traditional ways in the face of modernization. Reciting their history orally, lacking written records of their pasts, the Apatani maintain their traditions by remembering their legendary and mythical beginnings. Although many Apatani work professional occupations outside their region, they return to practice traditional ways especially during holiday celebrations. They practice a form of shamanism, although Christianity has been making inroads recently. Written records of the history of the Apatani tribe have never been discovered. Oral tradition reveals that throughout their history, the Apatani had a democratic system of running the society. The Tanii call their village council the Bulyang. The heads of sacrificed animals hanging over the grave(Biyu) of an Apatani man in Ziro. Apatani sacrifice animals and perform special rites on death of near ones. 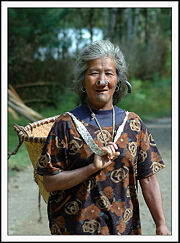 An Apatani woman with a basket going to field. The Apatanis wear elaborate and colorful, yet simple in style, traditional dress. Tattooing and the stuffing of large nose plugs (Yaping hullo), once popular among the women, has gradually declined in recent years. That practice reportedly started because the women wanted to look unattractive to males from neighboring tribes. 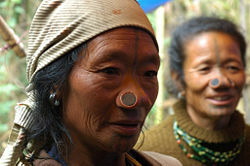 Apatani women have been considered the most beautiful among the Arunachal tribes. Younger members of that community have that traditional practice altogether. Traditionally, the men tie their hair in a knot just above the forehead (locally called as piiding) using a brass rod (Piiding Khotu) measuring twelve inches, placed horizontally. They wear strips of fine cane belt painted in red (Yari), and bent into the shape of a horse-collar with an elongated end. Those strips of cane are loosely fastened together, with the loop of the horse-collar being tied round the waist. The men tattoo (Tiippe) their chin, in the shape of a 'T' under the lower lip. The women tattoo themselves with broad blue lines from the forehead to the tip of the nose, and five vertical stripes under the lower lip in the chin. The women bundle up their tresses, rolled into a ball (Dilling) on the top of the head. They occasionally insert a brass skewer (Ading Akh) horizontally. Apatanis trace their descent patrilineally. While the status of men has been considered higher than that of women (he acts as the head of family), the sexes share responsibilities in the house and the family. Apatani women carry out the household chores of gathering both wild and kitchen garden vegetables, cooking, fetching of water, pounding of rice, cleaning of houses, washing of clothes and utensils, nursing, looking after infants and children, preparation of the tsampa, ginning and spinning of cotton and other jobs associated with the household. In the field, the Apatani woman carries out the tasks that include gardening, seeding, transplanting of paddy and millet, padding, weeding of fields and other activities. At home, women control the internal family income. The man also has his part in the farming work. Their wet rice cultivation system requires intensive labor, performed without farm animals or machines. UNESCO has the Apatani valley under consideration as a World Heritage Site for its "extremely high productivity" and "unique" way of preserving the ecology. In July, the Apatani celebrate the harvest festival of Dree with the harvest dance Pakhu-Itu. Scholars consider much of the information regarding the Apatani tribe in books or on the Internet outdated, based on observations made by Professor Christopher von Furer-Haimendorf in the 1940s. The Apatani have shown an impressive rate of progress since their first contact with the modern world, sometimes dubbed "Japatani" by their neighboring tribes, presumably as an allusion to the fast-paced technological evolution of Japan. Still, their traditional culture and customs still retain an importance in their culture. Many serve as high-level Government employees, doctors and engineers, working far from their native villages around Ziro. Even so, they return to their villages during important festivals, notable Myoko in March and Murung in January every year. The Apatanis celebrate Dree, another important festival observed in the major towns in Arunachal Pradesh and in some cities outside the state. As in any other developing countries, teenagers have been influenced by the culture of modernization, but the traditional customs still continue. ↑ "Unique Apatani impresses Unesco" Rajeev Bhattacharyya, The Telegraph, June 17, 2005. Retrieved November 29, 2007. ↑ North East Zone Cultural Centre Retrieved November 29, 2007. This page was last modified on 7 April 2016, at 19:19.